Monday morning, 10.00h. 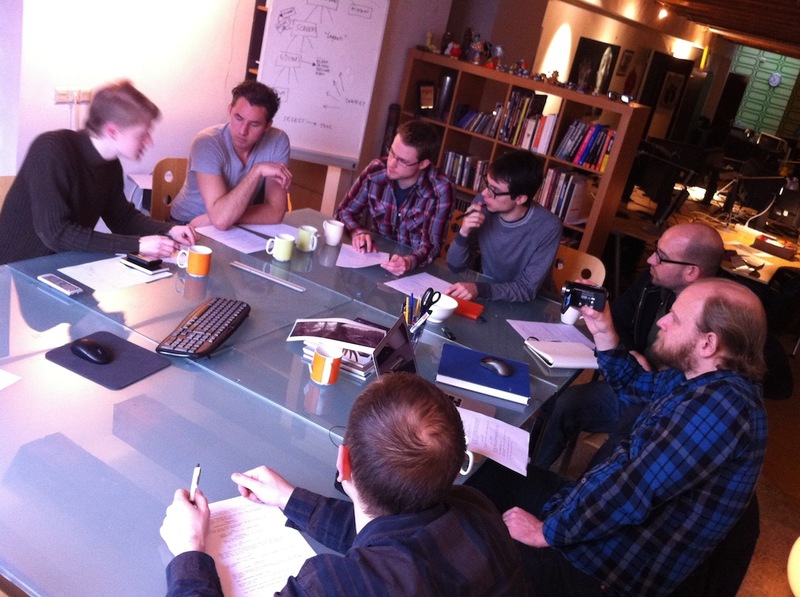 I delivered a script to the team, which they’ll have to turn into a short film within 5 days. Premiere will be here at 18.00h friday, on youtube an hour later! The process of making it will be shared as open as possible. So: here’s the script already linked to the right. Written by yours truly, playing here in the Blender Institute! By the end of the day it should become a full storyboard and shot breakdown. Tony Mullen will be here filming to deliver a documentary making-of! 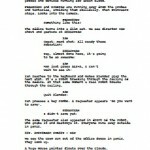 Really short but packed script. Really looking forward to see the results. Love the script. Funny and can’t wait to watch it develop! Any way the community could help put this together (modelling, textures)? Maybe use blog updates on this to test how “open” people like the real blogging updates to be. Personally I would prefer all-out open-ness for the full version, with the exception of the final scene of the film. As Ton stated, the journey of the “making of” for a project like this is as important as the final delivery, esp for other small teams who might want to walk the same path – allowing the team to freely blog about non-3D gotchas and issues, and how they were worked around, would IMHO far outweigh ( esp for the small sum of Euro 40 for the DVD ) reading about any spoilers ( other than the final ending of course ). Oh! I forgot to ask: what do you use to write your scripts? I’m not sure what Ton used, but I always use celtx (celtx.com), a really solid/powerful little open source screen writing program. Another open source option will be Trelby. For a second there I thought this was the first section of the main film…… it’s not right? Awesome idea, and a great way to put the team together! I’m curious to see what can be achieved in five days! Good luck to the team for this and of course for the whole Project Mango, and thanks for sharing these info with us! personaly I am just waiting for the process for making that I am prtty much exited Thank foward Ton to decied sharing that with us, thank ! Nice test for the team!! I’ll be watching this blog closely this week!! Can’t wait to see how this develops!! Great script! I’m gonna watch friday evening! Haha, great idea! I can’t wait to see it! When will the making of documentary be released? Just watched the script again. This looks like a “commercial” for Blender users: Remember to save your work, folks! This is a great idea. Nothing taught me the power of deadlines and efficiently as much as taking part in a few 48 hour game jams. The first time you’re all “And we’re going to add this epic thing, and this one and this one…” and you get crap all done. After a couple you’re more like “Ok, can we leave this out? How about this?… or thse? Or ALL of that?” and somehow it ends up being epic. I bet you this will end up creating a much more focused team who produce three to four times the movie than by having the team learn these lessons on the final film. there should be a mango throwing fight in there somewhere…..
Nah, they should throw Durian’s at each other, good juicy rotten ones. Mango isn’t finished yet and it would be bad to jinx a project before it even starts, though I do like your idea! Will you film it right in the studio? How do you plan to fake the lighting change when the robot smashes through the ceiling? Good script, except Blender does not actually ask you if you would like to save, it just closes. On the OSX version it has this requester already for years. It’s just waiting for the other platform devs to add too. WTF? Really? Scratches head and wonders how difficult it would have to be if the other platforms haven’t implemented it after year? Cool, looking forward to the final video!